Are you looking for a holiday recipe that is simple, yet sure to please? Well, I’ve got exactly what you need! My Salted Pretzel Holiday Bark recipe takes about 5 minutes to set up and is a gorgeous addition to any holiday table! This is the easiest bark recipe that I have ever made, yet people will think it took a lot longer. and the secret ingredient… a little seas salt. Step one: Melt the chocolate chips in the microwave by heating it in 30 second intervals. (my microwave took 3) Pour the melted white chocolate into a wax paper lined 8×8 or 9×9 pan and then, smooth it out. Step two: Place the pretzels on top of the chocolate. (I like to alternate) After that, sprinkle on a few Christmas sprinkles and then, finish it off with a light sprinkling of sea salt. Step three: Allow it to completely cool and then, break it apart! That’s all it takes to have some beautiful Salted Pretzel Holiday Bark on your holiday table. This bark recipe is so easy that you could make a double recipe, put it in a pretty box and give it as a gift! I hope you make this and enjoy it with your family! Do you like Chocolate Bark? It is so simple, you won’t believe it! Yummy! That looks good enough to eat. Oh, it is! Good enough to eat it all! It looks fantastic on a holiday table! This is great! I love how easy it is and it definitely would make a great gift! I can see how the sea salt makes this unique! It makes it perfectly salty and sweet! Oh wow they look amazing and so yummy. Can you believe it only takes 5 minutes to set up?! Nothing makes a Christmas party more than some tasty bark! It’s one of my favs. I love how many different varieties of bark there can be! I LOVE eating bark. Maybe I will try to make it now :). It is such a simple, but great holiday recipe! Anyone can make it. i always wanted to know how to make this. can’t believe how easy it is. So easy and it will definitely impress people! Oh yum this looks os good! Perfect timing for me too, as I have a holiday party to bring a treat to tomorrow! This one will be easy and ready to go! All I wanted to write here was, “Yes.” but you deserve a better comment than that. I find that bark doesn’t last very long at parties, does it? Too much of a hit. I love it. I would have known what you meant by just a “Yes.” 😉 It is absolutely one of the first things to disappear! I’ve never tried a bark recipe before, but this looks like something I could easily handle! Thanks!! I am so glad you made it and loved it, Rabia! Sounds like a great recipe! Looks easy recipe to make too! Ong this bark sounds beyond delicious!!! I want some right now!!! Um HELLO!! That looks amazing! And beautiful! But definitely wouldn’t last long around here lol. Yum, thanks for sharing! It is very appealing and it doesn’t last long around here either! So chocolate covered pretzels are a weakness of mine. I literally stopped what I was doing at work when I came across this just now to see the recipe because this looks awesome! Holly, it is sooooo good! You have to make it! The slaty taste of pretzels mixed with chocolate is a great combination. I love that this is semi-homemade–so it looks simple and quick. Salty-Sweet is my favorite combination! I love it. I LOVE easy hacks like this – good one! You know me, the easier the better, LOL! Sweet and salty is such a tasty combination. Bark is a great holiday gift idea. It’s a fantastic gift idea because, really, who doesn’t like chocolate in one form or another! Ummm yeah. I love you. This is the next best thing to you living next door. Chocolate? Salt? Pretzels? Oh yeah baby! It’s ok. I accept you affection and return it indeed! Kindred spirits. How awesome would it be if we were neighbors?! This recipe looks so so good. I wish I had the ingredients to make it right now! Thanks for sharing. Grab them next time you are at the store! You won’t regret it! It is a beautiful presentation and it tastes wonderful! Quick, easy and yummy are a wonderful combination especially during the busy Christmas season! Pinned to my Cookies and Candy board. Stopping by from Momma Told Me. We would love for you to share with us at the Home Matters Linky Party! Thanks for pinning it! It is the perfect recipe for us busy bloggers! I hope you do! It is absolutely delicious! This recipe looks like it’s very easy-to-do. And, you got me at the yogurt covered pretzels. I’ve not tied it, but it sounds yummy and something I’d like. Oh man! This is the easiest and most delicious candy recipe! Never had salted bark. However, I can see the appeal of the sweet & salty combo. Sweet and salty is my favorite flavor combo. This looks so good….I just took a small bite…..Thanks for stopping by this weekend to share on Friday Features on Oh My Heartsie Girl. Hehehe, I hope you enjoyed it, Karren! 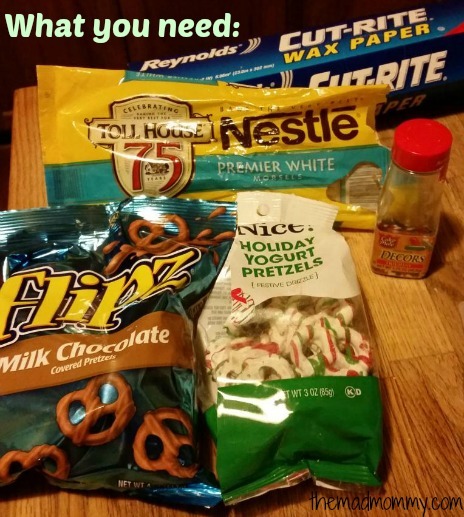 I was going to make peppermint bark for my Christmas party next week…. but now I’m making this!! Awesome! I love sweet and salty!! Thank you so much! It is super yummy! This looks easy enough for me to make and delicious enough to eat all by myself. lol Thanks for linking up at the #HomeMatters linky. It disappears VERY fast, LOL! Thank you so much for joining us on #PureBloveLove Link Party! 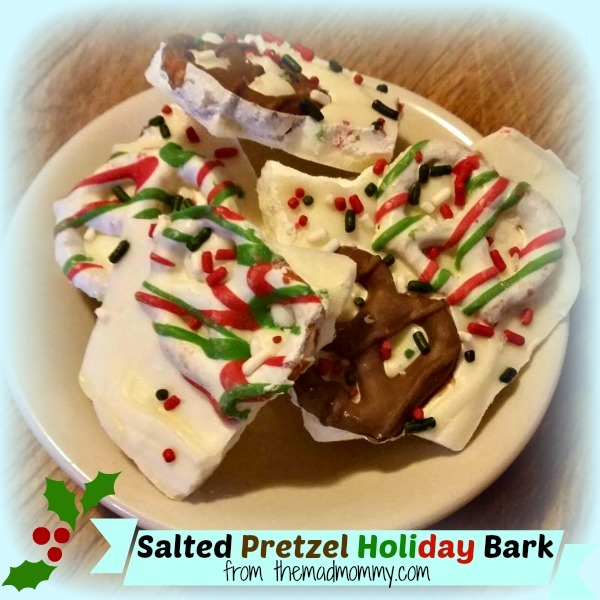 I loved checking out your blog and was delighted with your Salted Pretzel Holiday Bark! Thanks for dropping by and sharing, we look forward to having you stop by next week at 8 pm on Thursday–Sunday with more awesome treats! So festive and soooooo yummy sounding. Oh I want to reach into my computer screen and eat this! I love holiday bark and this one sounds super easy! I don’t think I’ve ever tried that yogurt covered pretzel, sounds good. Pinning this! Wow, these look decadent! Thanks for sharing with Tasty Tuesdays!